While there are many movies with incredible scenes to learn from, I decided for my first post to start with this specific section from Nightcrawler. For those of you who haven’t had the opportunity to watch the movie, it is most definitely worth your time. The story revolves around a driven and desperate man named Lou Bloom (played by Jake Ghyllenhaal) ready to do anything for a job. Throughout the movie, we discover more about Lou’s sociopathic tendencies and there are many scenes that would provide valuable insight into negotiation skills and people management. That being said, I decided to focus on what is probably the most positive act in the movie, which directly relates to a concept I’m very fond of called flow. This part happens more or less in the middle of the movie. Lou decides to tell a little bit more about himself to Nina (played by Rene Russo). Lou chooses to surround himself with an aura of credibility and openness by deliberately showing a weakness and a strength. Whereas Lou doesn’t have any formal education, he’s a quick learner with a passion for television news – something he believes to be competent at. “Flow is the mental state of operation in which a person in an activity is fully immersed in a feeling of energized focus, full involvement, and success in the process of the activity” (Csikszentmihalyi, 1990, pg. 73). The flow is a concept named by Mihály Csíkszentmihályi referring to a mental state in which a person is fully immersed in a specific action. The flow characterizes complete absorption in what one does. Remind a moment in your life when you felt everything was right, you were doing what you wanted to and you where doing it well. Time seemed to move differently; all your energies were focused on the task and you enjoyed doing it. It’s like a water current carrying you along the way. You were in flow. To simplify, we could say that being in flow means that you do what you like, you like what you do and you do it well, which makes you feel happy. All these aspects may appear independently and only when all of them apply can we talk about a so-called flow experience. To measure the flow for a person in a point in time Csikszentmihalyi compares the skills a person has while dealing with a challenge. Skills and challenges have to be adapted for a person to be in a state of flow. Low skills facing high challenges may bring worry and up to anxiety; whereas high skills facing low challenges can convey boredom and laziness. For a person to be happy, they must be able to face challenges that are not too high, yet challenging enough to learn from and get motivated by. How does this scene relate to the flow? Flow isn’t positive or negative in the sense that a person can be in a state of flow doing morally wrong actions. Some might even insinuate that criminals may more often experience flow than the average person, for they’re driven by passion. This movie shows exactly that! A cunning and morally loose person living the flow. 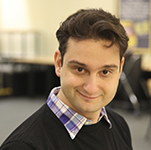 Lou Bloom has a strong desire to learn and be successful. And yet, his lack of formal education, his age (30+) and lack of empathy don’t provide him the right tools to access interesting and challenging jobs that will engage him for a long time. In addition, his financial issues drive him to become opportunistic and take whatever job he can, well beneath his real aptitudes. At the beginning of the movie we find out that Lou is a thief, stealing metals to resell them. By getting into the video news he starts stealing video-shots where most people will refrain themselves. Basically, he replaces he working tools with a camera, but at the bottom, little has changed in his modus operandi. Two human traits that differentiate him from his competitors, his lack of empathy and his cold-blooded logic, provide him with the resources to film what others would deem morally wrong. His first success becomes an opportunity to open a door he didn’t know exist: the flow door. By his next shoot he realizes he can go beyond competition and starts enjoying this new endeavor as a game. Up till today he worked to make a living or even survive. From now on he will start to live for the job or more correctly to be in flow and that is what he concisely expresses to Nina in that specific scene. Coming back to games and more specifically video games, Csíkszentmihályi doesn’t really consider them to be activating the state of flow. The reason behind it is that flow will make you grow and improve, while TV and games are a substitute or a way out of reality. On the long run, they won’t make you happy and often will make you feel you wasted your time. 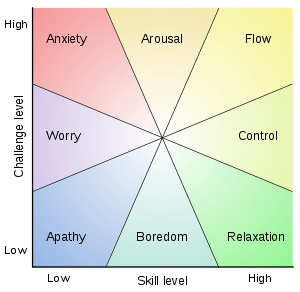 Ironically, flow theory has been widely used within games to instill a desire to be played. Great video games include all the elements for the player to live the flow while playing. Through the balance of skill and challenge the player’s brain is aroused, with attention engaged and motivation high. One of the key strengths of video games and principally role-playing games such as Skyrim, is that they are immersive and the player can build on his competences. The player gets to choose between different skill-sets and see his hero evolve while playing, adding new skills after each level-increase. The same applies here to Lou; each time he meets a video news character or faces a specific new challenge he discovers innovative means to improve his work. He does what he likes and he is getting better at it! What can we learn from Lou? Throughout the centuries individuals and groups have been looking for the magical potion for happiness. As happiness is both a value and a state of mind it is a subjective concept perceived differently by each one of us. Therefore, there is no miracle solution that works and impacts us all. Nonetheless, if happiness is a state of mind, then it means that the source of it is hidden and latent within each one of us and all we have to do is find the appropriate way(s) to unlock and activate it. In this scene, Lou delivers us two major teachings. People have been searching for purpose and happiness since life exists. Purpose however, requires a more developed brain to investigate. What is our purpose in life, why are we here? While both seem to have a different level of complexity to them, they are unique to each one of us. We create our own purpose (up till the day we have the real all-encompassing answer) and we give purpose to our life by acting congruently. Finding out what makes us happy is a way to understand our purpose and being happy results from experiencing the flow in our professional and/or personal life. Leading our own life can be more fruitful if we adopt the concept of flow and search for activities that provide us this state of mind. Lou is happy because he found a professional path he likes and he’s good at. Moreover, it becomes his personal mission which strives him to be the best he can. He found his purpose. The example of the website Lou talks about would be a good way to start. In my case, I decided to create this website as I realized I enjoy writing about ideas and concepts and that would also help me professionally. I like making links between different subjects and I become more aware of who I am as a person through introspection and sharing these ideas during conversations. Writing this blog is me being in my flow. How about you? Are there activities that bring you in flow? Why you pursue something is equally important to what you pursue. While we don’t see it in this scene, Lou often talks about these points with the other characters he’s working with. He may be a sociopath, but he fully understands the concept of flow. Leading by the flow, could be a fresh approach for leading a team. By providing each employee with opportunities to experience and express flow, one opens a path to generate more engagement, increase ownership and loyalty, which improves company results (see Gallup’s study). Introducing a work philosophy adopting the concept of flow may require some changes to the work environment and the work flow. It could start for example by explaining first to the other colleagues what brings us to flow. Sharing may open others to talk about what they want and having that knowledge may help set in place a flow-friendly work environment. In addition, flow may go viral. When a group of people express the same desire to achieve a common goal and consequently succeed in combining their focus and efforts to achieve this goal, they may be in sync with their flow. Professional team sporters should experience it often (when they’re not too focused on their bonuses). How about you? Do you experience flow at work? Do you know companies that have flow as part of their business or are interested in expanding the topic? Or, do you have any knowledge about training and consulting companies in that field? 6. Fastcompany – Inspiration from video games to get into a flow state at work.